I visited Microsoft Tech Days 2010 two days ago (I got free ticket), and if you are interested in technical stuff I leaned at the event and understand Finnish, you can my news report of that event published at Prosessori web site. I saw a quite interesting musical performance on the evening party. There was a band whose main instrument was two theremins (sorry for poor picture quality, this picure was taken on with cellular phone camera on and the lighting conditions were hard for taking photograps). 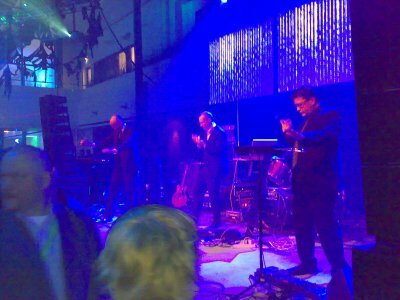 The name of the band was Farther-Out (they said they have made some previous concerts and released one CD “Tuo”). The theremin is an early electronic musical instrument controlled without contact from the player. It is named after its Russian inventor, Professor Léon Theremin, who patented the device in 1928. Theremins are distinguished by the fact that they are played without the performer touching the instrument. The musician moves his or her hands in proximity to the theremin to control the tone of the sound. I was told that mastering the theremin requires skills and lots of practicing, but only a few instrument provide the unique visual appearance of performance. The sound is quite unique for that instrument. Even if you don’t know theremin by name, you might have heard the sound of it at The beach boys -good vibrations or on the sound offects of some old scifi/horror movies. The electronics of the theremin consists of two high frequency oscillators connected to antennas. When the player moves hand near the antenna, that changes the frequency of the oscillators, and that changes the sound (frequency or amplitude depending on antenna). 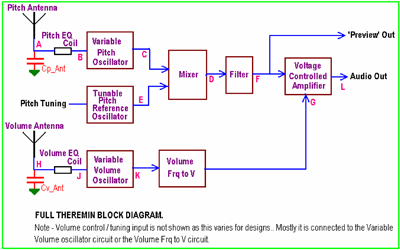 Here is a block diagram of theremin from www.thereminworld.com Fred Tells All article. All DIY persons now interested in theremin instruments can also view Make a Theremin video and check ePanorama.net theremin links. Amazing, I found your site on Yahoo poking around for something completely different and I really enjoyed your site. I will stop by again to read some more posts. Thanks! What shows do you go to? RMAF? CEDIA? CES? High End Show? California Audio Show? Capital Audiofest? I wish there were more pictures (I admit it… I’m a photo junkie). I can’t remember the last time I had so much fun reading a blog. Kudos! What’s up, its good piece of writing about media print, we all understand media is a great source of information. Profit operational emanates from repeat customers, customers that boast about your project or service, understanding that bring friends using them. It isn’t really that which you pay a man, but what he costs you that counts. The instrument used in Good Vibrations was NOT a Theremin, it was a Tannerin. Google to see one. The Electro-Theremin, often called the Tannerin, is an electronic musical instrument developed by trombonist Paul Tanner and amateur inventor Bob Whitsell in the late 1950s to produce a sound to mimic that of the theremin. The instrument features a tone and portamento similar to that of the theremin (or thereminvox), but with a different control mechanism. The instrument was custom-built at Tanner’s request. Tanner appreciated the theremin’s sound, but wanted greater control of pitch and attack. Most famously, Tanner played his Electro-Theremin on three tracks by The Beach Boys: “I Just Wasn’t Made for These Times”, “Good Vibrations”, and “Wild Honey”. Tanner’s prototype Electro-Theremin appears to have been the only one made. I’ve been gone for some time, but now I remember why I used to love this website. Thank you, I will try and check back more frequently. How often do you update your blog? I update the blog several times every week. Sometimes every day, sometimes every 2-3 days. It’s amazing to visit this web site and reading the views of all friends on the topic of this piece of writing, while I am also keen of getting experience. Thanks for your tips on this blog. Just one thing I would wish to say is purchasing electronic devices items through the Internet is not new. In fact, in the past few years alone, the marketplace for online electronic devices has grown considerably. Today, you will discover practically any specific electronic tool and devices on the Internet, ranging from cameras plus camcorders to computer parts and gaming consoles. The man leaned over his creation, carefully assembling the tiny pieces. This was the hardest part, placing a thin silver plated diaphragm over the internal chamber. The diaphragm had to be strong enough to support itself, yet flexible enough to be affected by the slightest sound. One false move, and the device would be ruined. The man in this semi-fictional vignette was Lev Sergeyevich Termen, better known in the western world as Léon Theremin. You know Theremin for the musical instrument which bears his name. In the spy business though, he is known as the creator of one of the most successful clandestine listening devices ever used against the American government. In 1920, while working on his dielectric measurement device, Theremin noticed that an audio oscillator changed frequency when he moved his hand near the circuit. The Theremin was born. In November of 1920 Léon gave his first public concert with the instrument. He began touring with it in the late 1920’s and in 1928, he brought the Theremin to the United States. He set up a lab in New York and worked with RCA to produce the instrument. In 1938, with the Nazi threat growing stronger, Theremin returned to Russia. Upon arrival in Leningrad, Theremin was imprisoned, suspected of crimes against the state. He found himself working in a laboratory for the state department. This was not an unusual situation. Aircraft designer Andrei Tupolev and missile designer Sergei Korolyov were two of many others who faced a similar fate. It was during this time as a prisoner that Theremin designed his listening device. A group of 10 to 15 year old boys from the Young Pioneer Organization of the Soviet Union arrived at the US embassy carrying a hand carved great seal of the United States of America. The seal was given as a gesture of friendship between the US and Soviet Union. Harriman hung the plaque in the study of his residence, Spaso House. The device, later known as “The Thing”, would not be discovered until 1952 — roughly seven years later. The discovery of the great seal listening device is an interesting one. British broadcasters reported hearing American voices on the their radios in the vicinity of the American embassy. No Americans were transmitting though, which meant there had to be a bug. Numerous sweeps were performed, all of which turned up nothing. Powering up his equipment, Bezjian began a sweep of the building. With his receiver tuned to 1.8GHz, he heard the bug’s audio, and quickly isolated the source in the great seal. Close inspection of the carving found it had been hollowed out, and a strange device placed behind the eagle’s beak. No batteries or wires were evident, and the device was not powered through the nail which had been hanging the seal. The great seal bug quickly became known as “The Thing”. It was a passive resonant cavity device, containing no batteries or other power source. It consisted of an antenna and a small cylinder. Passive resonant cavities had been explored before, both in the US and abroad, but this is the first time we know of that was used for clandestine purposes. In his book Spycatcher, British operative Peter Wright claims that the US came to him for help determining how the device worked. Regardless of who figured out the device, the method of operation is devilishly simple. The Soviets would sit outside the embassy, either in another building or in a van. From this remote location they would aim a radio transmitter at the great seal. The bug inside would receive this signal and transmit voices in the room on a second, higher frequency. It did all of this with no standard internal components. No resistors, no tubes, no traditional capacitors, or the like. There were capacitive properties to the mechanism. For instance, a capacitor is formed between the diaphragm and the tuning peg of the device. While bugs of this type have fallen out of favor, the idea of “illuminating” a device with an external transmitter lives on. Check out [Elliot’s] description of the RageMaster bug from the ANT catalog here. Resonant cavities have found common use as well. Every microwave oven or radar system with a magnetron uses one. But by the new electrical system of Theremin, which depends, like the original device named for him, on the phenomenon known as “body capacity,” it is possible for a dancer to dance in tune as well in time. In place of the rods used in the first “Theremin,” there is an insulated metal plate beneath the dancing floor. As the dancer bends towards it, the electrical capacity is increased, and thereby the pitch of an oscillating tube circuit is lowered; as she rises on tiptoe, for instance, the pitch of the oscillator is increased. The output of this oscillator is beat against that of another of fixed tune, producing an audible (not superhet.) frequency and this is amplified and fed into a large, square reproducer. Thus the motions of the danseuse are concerted into tones varying in exact synchronism with her pose. As the name implies, this is Open Hardware and we’re quite happy with the documentation on their site and the BOM (found on the GitHub repo). If you don’t want to build your own they’re selling kits on their site for 48 Euro delivered, or on Tindie for $55. Schematics, printed circuit board (PCB) design, bill of materials (BOM) for the Open.Theremin.UNO arduino shield. For software see separate git repository. This open-source Theremin offers additional capabilities over traditional implementations, including a dual-pitch mode. Theremin were manufactured in the US for a time by RCA, and later by Moog (of Moog Synthesizer fame). In fact, you can still purchase a Moog Theremin, either pre-built or in kit form. I recently ran across Open.Theremin by Urs Gaudenz in Switzerland. This comes to life as an Arduino shield. Unlike many inexpensive Theremins, which often control pitch only, this device controls both pitch and volume like the original. Open Theremin is an open source hardware and software project. The aim is to build a next generation, digital version of the legendary music instrument. The all new Open.Theremin.UNO is based on the popular ARDUINO development board and can be reprogrammed easily. Build your own, fully playable theremin with pitch and volume antenna. Let’s inspire the next generation with exciting and educational kits that anyone can build. Want to create your own theremin? 3D modeling for geologists is often done using the Environmental Visualization System (EVS) along with the Mining Visualization System (MVS). This nifty device will be handy as your traverse back with the wilderness to your Caribbean resort. like the HAL 9000 gadget, that is simply a button you push, and plays quotes through the 2001 film.